So, spring arrived some weeks ago in Frankfurt. The daffodils and cherry trees are in full bloom and I’ve already witnessed the first crazy guy in short sleeves. For those of you from the south who may not be familiar with this particular crazy guy, let me explain. This is a phenomenon anyone who lives in northern climes will be familiar with. Every year after a long and cold winter the sun will momentarily peek from behind a cloud and, though the temps may still be cold enough to see your breath, some crazy guy (sorry to generalize here but it’s usually a man) will have a stoke of optimism and head out in his shorts and tee shirt. In the spirit of spring my husband and I have embarked on a mammoth cleaning effort. There is a method, or at least a reason, to our madness. We’re moving! Not far. Actually, only 2 blocks away. Unfortunately, the short distance does not seem to make the packing and unpacking any less tiresome or any less expensive. Which is why we’re in the process of purging all the stuff which we never use and don’t need. This includes cook books! Yes, I have ever so bravely put together a pile of 10 cookbooks which I haven’t used once since I paid for them to be shipped from the US to Germany 7 years ago. Sad really. But no worries, I still have 2 full bookshelves piled high. To be honest, Dorie’s book rarely ever even makes it to shelf because it always seems to be in use. Either I’m cooking from it or looking up ingredients for my grocery list or browsing it to see which recipes I should vote for next month. It gets a lot of use that book and I have to say that it’s held up impressively well. Which is a good thing because we still have quite a few recipes to go. But one more which we can check off the list is this past week’s Sausage-Stuffed Cornish Hens. I knew in advance that this one was going to be a winner because I love cornish hens (or poussins, or stubenküken, or whatever is available in your neck of the woods) and I really can’t think of a single recipe from this chapter which I haven’t liked. The recipe was a fairly simple preparation and I turned it into a one pot meal by throwing some brussels sprouts around the birdies before they went into the oven. The brussels sprouts were tasty, the little hens were juicy and delicious and the stuffing was quite good as well. I might remain partial to the spatcocked method, but this was darn good and yet another winning poultry recipe from our Dorie. Your poussins look good – and brussels sprouts make a great side. Cherry trees and daffodils sound delightful! I know about crazy guys from my stint in London. Good luck with your move. researching something. Your little hens look wonderful with those brussels sprouts. They were really good, weren’t they? Good luck with the move. Now that’s what Cornish Hens (poussins) should look like – dainty little birds. I could not find them here. Surrounding them with brussels sprouts is an ideal choice. I have been able to find brussel sprouts at our farmers market for the past few weeks and I always buy a bunch. Roast them, like you did, and devour them all – first, hot, then cold. Good luck with your move. Kudos to you for purging before you move. I didn’t do enough of that as the years moved along and paid the price with a gigantic job the past few moves. I also got rid of many cookbooks and then just bought more. Go figure. Brussels sprouts roasted in the pan, yum! What a stroke of brilliance. 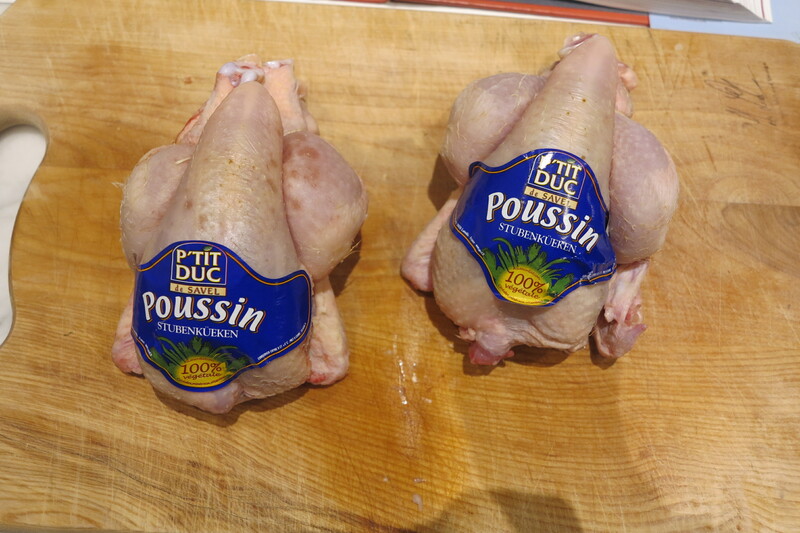 Your poussins look fabulous! I dread the next time I move. My cookbook habit already fills the shelves in an entire room, plus I have more. I will be in trouble. Good luck with your packing and settling into your new home. I hope the new place has a great kitchen. You deserve that! Looks like a glorious meal! And I have some purging to do, too! Love the brussels sprouts! this is on my make again list! I know crazy guy very well. It is finally supposed to hit near 30 today, so I have a feeling a couple of those may be out and about. Best wishes on your move – I am cleaning out my spare room this week and that is proving painful. I don’t even want to think about what it will be like when I have to pack up the whole house sometime in the next year or two. Funny, my Dorie book is always out…usually sitting on my coffee table because that’s where I read it and compute from! 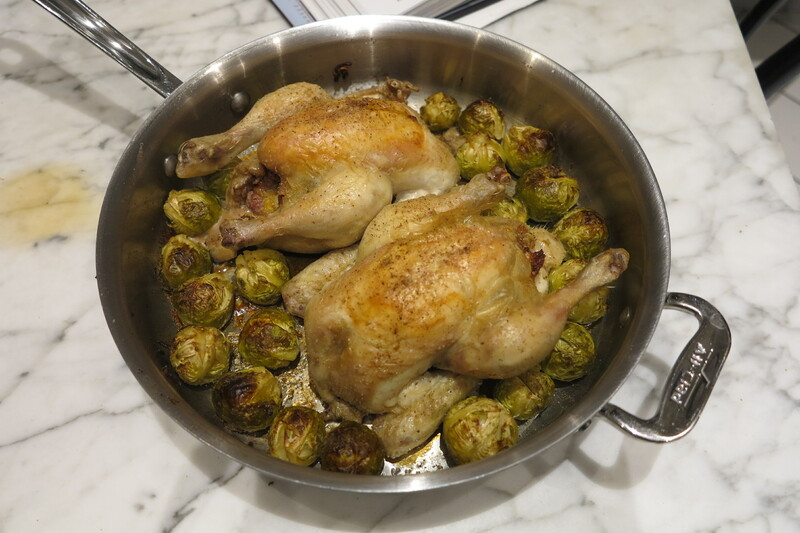 Your Poussins look fabulous…I love that you roasted the brussels sprouts with the birds. Good luck with the move and clean-out…I have been cleaning out things lately myself, I know sooner or later we will be putting our house up for sale. Have a great weekend, Rose! Don’t work too hard! I love the idea with the Brussels sprouts. I roasted sweet potatoes in the oven at the same time, but I didn’t think to put veggies in, probably would have helped the hens stay in their side with the 15-15-10 method. Nice job. Great idea to roast some vegetables with these. Yours look beautiful! I am so in need of a purge. I do a little here and there (and even managed a few cookbooks too! ), but it’s hard. Good luck with yours!! Enjoy the spring weather. Genius to add the brussels sprouts to the pan ! I will definitely have to do this next time as we actually all adore that little green veg in my house. Good luck with the move. I have been cleaning since the New Year but mostly because we have had so much snow and my boys are finally both in school (and I have a fighting chance to purge…..) that the time finally seemed right. But it is a big process indeed. And you had me chuckling about the short sleeved guy. We tend to have the teenagers locally dressed for about 30 degrees warmer than any weather we are actually experiencing. Makes me feel even older (but wiser :). We have lots of “crazy guys” – yes they are mostly guys who not only wear short sleeve shirts but also shorts here in Zagreb!!! But in their defence it has been unseasonably warm the past couple of days. It was 25C today! Anyway those irds look wonderful! It’s a pity I could not find them here! I stuffed a chicken and it turned out great! Have a great week!! I loved these too! Great idea to add Brussels sprouts to the pan. I like the idea of adding brussel sprouts. I wish I had thought of that…I love looking out my office window and watching the people dressed for “spring.” Usually the warm weather doesn’t last this time of year, but I do admire the optimism.